Learn how to turn your shower water into flowers (and other landscape plants too)! This 1 day workshop is a unique opportunity for homeowners and skilled professionals including landscapers, plumbers, contractors and builders to learn how to create simple, affordable, effective water conservation strategies. Learn how simple it can be to send your shower water to your landscape. Did you know that 65-75% of our residential water use is used in the landscape? By re-routing shower greywater from our wastewater treatment facilities to our landscapes we can drastically reduce water consumption throughout San Diego! Greywater use can be very simple and cost-effective when passive strategies are used. But what are the permitting requirements and best practices around these strategies? We will not only tell you, we will show you in this hands-on workshop! Designing and installing water harvesting earthworks. How to improve onsite water retention using soil, earthworks, basins, and plants to accentuate your active water harvesting strategies. We tend to only offer this workshop once a year! 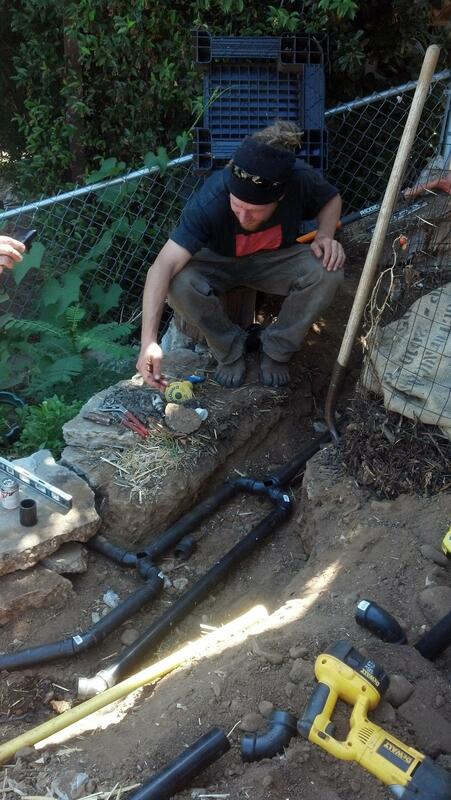 Can't make this workshop, but would like to learn how to install a greywater system? We will let you know when similar workshops are held and will send you resources to help.